Detailed review of Digestive Advantage Probiotic Gummies. See how this probiotic supplement compares against all the others! Overall, at 3 out of 5 stars, Digestive Advantage Probiotic Gummies is a slightly above average probiotic. First off, who doesn’t love a gummy? I know gummies usually mean added sugar and calories and usually aren’t that healthy, but needless to say I’m still a gummy fan. Gummies are also great for kids and anyone who isn’t a fan of swallowing pills. The gummies have a slight medicine after taste to them but for the most part they taste and chew like a gummy candy would. There are several different flavors in the bottle but none are drastically different, but you might find you like grape better than lemon, etc. I love that this probiotic is safe for kids, just be sure to consult your pediatrician beforehand just to be safe. The directions say adults and children 4 years of age and older should chew 2 gummies daily to support digestive and overall health. It also says to take 4 gummies daily if you want to reduce the occasional digestive upset, lesson belly pain, and help relieve diarrhea. For children 3 years old, they should only take 1 gummy per day. I also like that this probiotic is convenient and doesn’t have to be refrigerated or taken with water. Since this probiotic isn’t very potent (only 250 million CFU per gummy), you do have to take multiple per day. I like it better when you only have to take one, but since it’s a gummy and tastes pretty good it’s hard to complain too much. Another thing I don’t like is that it contains SOY. This is a big allergen for people. A few other things I don’t like is that it’s not very diverse or potent with only 1 probiotic strain and 250 million CFUs and it can be rather expensive if you take the maximum 4 gummies per day. 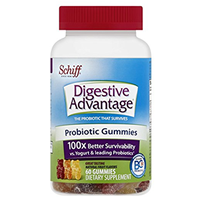 Overall, at 3 out of 5 stars, Digestive Advantage Probiotic Gummies is an average probiotic because it’s a yummy, convenient gummy that doesn’t need to be refrigerated and is safe for kids, but it contains soy and can be expensive if you need additional support. Digestive Advantage Probiotic Gummies contains 250 million cells in 1 probiotic strain. The particular strain used is BC30 Bacillus coagulans GBI-30, 6086. I like the use of this strain because it has been shown to potentially help with different types of diarrhea such as infectious types like rotaviral diarrhea in kids, diarrhea caused from taking antibiotics, and traveler’s diarrhea. Bacillus coagulans may also help with digestive disorders such as Irritable Bowel Syndrome (IBS), Crohn’s disease, ulcerative colitis. This particular strain may potentially reduce digestion problems and respiratory infections. Digestive Advantage Probiotic Gummies do have some allergy concerns. First off, the gummies contain SOY. A few other potential issues are corn syrup and gelatin. These are much lesser frequent allergens but some people do have trouble digesting them. The other ingredients include: sugar, water, citric acid, natural flavors, lactic acid, and colors from fruits and vegetables. For 60 gummies, lasting 15 to 30 days, it costs $17.62. If you take 2 gummies daily, it works out to be $0.58 per day. If you take the maximum amount, which is 4 gummies daily, it works out to be $1.17. Taking 4 gummies daily definitely ends up being expensive. I do think it’s a good price for the value if you’re only taking 2 gummies a day. However, for additional support, you may be better off finding another product for your money. I didn’t see any side effects when taking the gummies. There are only 250 million cells per gummy, so even if you take the max amount of 4 it equals 1 billion cells, which is on the gentler side. One main thing to keep in mind is that children may experience a laxative effect if they consume an excessive amount of gummies. Digestive Advantage Probiotic Gummies has a 14-day, 100% satisfaction guarantee. If you buy their product from a local retailer or online and try it for 14 consecutive days and don’t see improvement with occasional belly pain or bloating, then you can get your money back in the form of a check. I wish they gave you more than 14 days to try it, but I’m still happy they offer some sort of guarantee. To buy Digestive Advantage Probiotic Gummies, click here.